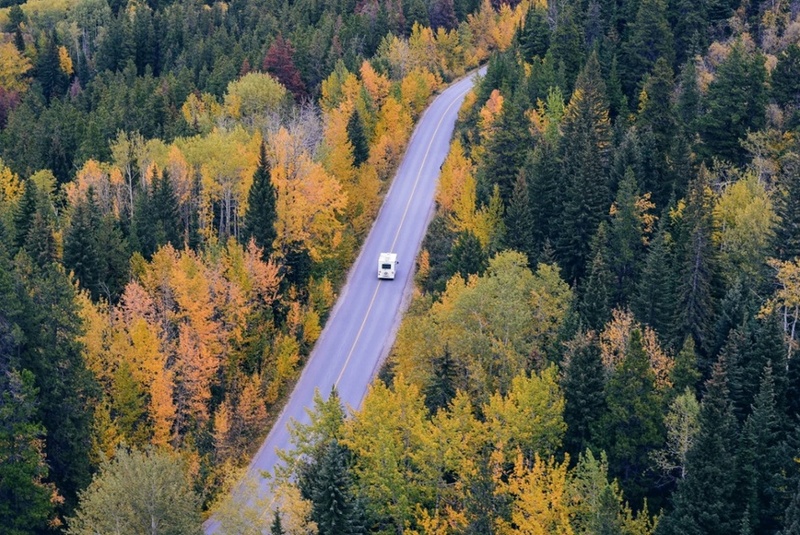 If you’ve never been RV camping in the fall, this is the year to go! Fall RV camping has a lot to offer, as the once crowded summer campgrounds will have cleared out, and off season prices just can’t be beat. Pair that with a wonderful lack of pesky bugs, and the gorgeous fall colors, and how could you not have a great time? Camping in an RV offers many benefits that tent camping just cannot – like having access to a kitchen, heat, and running water – making camping in the fall a comfortable getaway. So if you’re ready to get away from the crowds and take in some fall color, here’s a few things to remember. First, you’ll want to check your RV furnace itself. Make sure everything is in working order, and nothing looks burnt or out of place. Sometimes insects build nests in or on the furnace, so make sure to remove any of those, and clean the area around the furnace. If you see any soot, or signs that the furnace isn’t combusting properly, it’s time to call the RV repair company. If your RV did not come with an installed carbon monoxide detector, you need to purchase one designed for RVs. Carbon monoxide is a very serious issue, and since an RV is such a small space, any leak needs to be detected immediately. Make sure you test your detector before you head out on any trip, and change the batteries regularly. From time to time, your heat ducts may become damaged or crushed, just by normal wear and tear. It’s important that you inspect these, even your floor ducts, to ensure that your RV is safe for travel inchillier weather. If any of your ducts aren’t looking quite right, or seem to be blocked, it’s probably time to call a professional to get them fixed. There’s one last thing to check before you hit the “on” switch on your furnace. Make sure the area around the return air vent in your RV is clear, and free of obstruction. You can also clean the vent itself out with a vacuum. Bonus Tip: It’s a good idea to have your RV furnace professionally inspected and cleaned once every few years. This is the best way to prevent any surprise issues or breakdowns in the middle of a chilly trip. At this point, you can turn on your RV furnace and see how it runs! Again, we advise that you do this while you’re still at home, and well before you leave for your trip. You’ll want to give the RV a little bit of time to warm up, but make sure you hear the furnace kick on when you raise the thermostat. If not, it’s time to call a pro. Outside of having proper heating, how can you best prepare for a fantastic fall RV camping trip? Many RV parks and campgrounds close for the fall and winter. Make sure you call ahead to reserve your spot, that the places you want to hit are open, and double check that they take your size RV. A little bit of planning will go a long way if you’re on a multi-day camping trip and plan on hitting a couple different campgrounds. It’s a really good idea to plan your route, and then have alternate ideas in case something happens. Fall weather is notoriously unpredictable, and if you’re going somewhere in the mountains, you never know when the passes might close up. What’s more, it could be constant rain on your first-choice destination, and nonstop sunshine on your alternate route. Giving yourself a backup option means you’ll definitely get the most out of your fall RV camping trip. Sure, you plan on having the heat on, but it takes a lot of power to run that furnace all the time. So make sure you pack appropriately. Bring sweatshirts and long pajamas so you can back off the heat just a tad to save some money. You’re probably not planning on staying inside the RV the entire time, right? So you’ll want to have gloves, a jacket, boots, and a hat to keep you nice and toasty while you’re sitting around the fire! If you’re camping in Michigan, you know the fall colors can’t be beat. You’ll definitely want to pack your hiking shoes so you can get out there and do some exploring. Even if you’re camping out of state, most parks in the Midwest and out East will be showing beautiful fall color, and you won’t want to miss it. Bonus Tip: If you’re in the UP for your fall trip, make sure you check out Spectacle Lake. One of the great bonuses to RV camping is your ability to bring your own food. Not only do you get to enjoy the comforts of home on the road, but you can save a bundle too! Make sure to stock up on your favorite fall favorites, and bring easy staples like pasta and rice. If you want to get fancy, why not roast your favorite root vegetables in that cast-iron pan? Nothing says fall like squash and sweet potatoes! If there’s anything you need for your upcoming fall RV camping trip, make sure to check out the Earth’s Edge website. Earth’s Edge stocks a wide variety of camping, hiking, and outdoor sports goods, so if there’s something you’re missing, we’ve got it!